I have ruminated on the quote by Hafiz, which took me on an interesting journey to discover the background behind his quote. I learnt from this article “Music of the spheres” that his quote was inspired by an Eastern legend about how “the soul has entered the body of clay or matter” in order “to experience the music of life, and to make this music clear to itself”. Yes, I can relate to this as I am often touched deeply at the core of my soul and be connected to the Divine in us through the power of music that is able to balance and clear my chakras. I feel peaceful and joyful when listening to such music, and music is one of my main avenues of healing and restoration that I turn to, besides Nature and meditation, for example, whenever I feel stressed or disoriented. 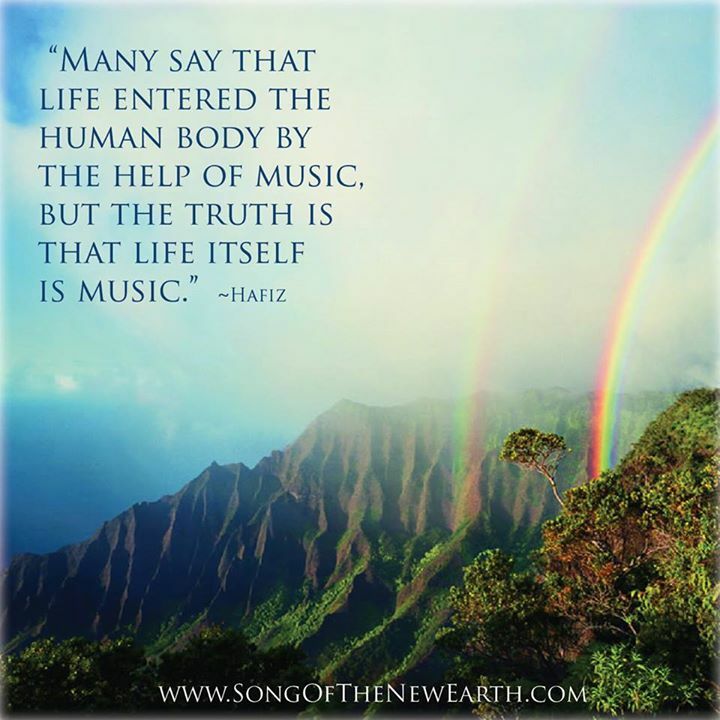 I also visited the website of “Song of the New Earth” that is mentioned in the picture of the quote in your email, and I learnt from its webpage on “how sound vibration speaks to our souls and bodies by opening a door that bridges our cognitive thinking; catapulting us towards insights into the miraculous”. Yes, there is something about music in all its beauty and mystery that makes life much more colourful and alive, in its power to move us, inspire us, calm us, soothe us, heal us, soothe us, and feel us in all our moods and emotions in a deep and profound way. Like the poem “Awake” says, “you are the music, you are the song, you are the melody, you are a workmanship created in Love”.